When the Imagine Network commissioned a documentary on mermaids, to be filmed from the cruise ship Atargatis, they expected what they had always received before: an assortment of eyewitness reports that proved nothing, some footage that proved even less, and the kind of ratings that only came from peddling imaginary creatures to the masses. They didn't expect actual mermaids. They certainly didn't expect those mermaids to have teeth. This is the story of the Atargatis, lost at sea with all hands. Some have called it a hoax; others have called it a maritime tragedy. Whatever the truth may be, it will only be found below the bathypelagic zone in the Mariana Trench…and the depths are very good at keeping secrets. 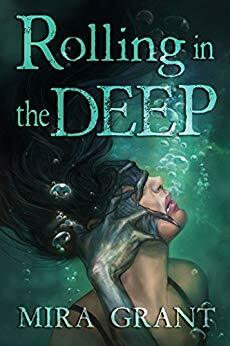 A lovely, horrifying prequel to Into the Drowning Deep. Anyone who has read the main novel knows how this prequel is going to end, but I was still on pins and needles waiting to find out the fate of the crew on the Atargatis. And the sirens were just as horrifying (maybe even more so than the novel). A great read!